It is a smart world out there indeed. Genius is often challenged, leaving the once celebrated minds seem just amateurishly wise. While there is no doubt that the genius minds of Einstein, Graham Bell, Edison, and many others are venerated and will eternally be celebrated by mankind, the challenging spirit of men has far exceeded what they initiated. So when Apple does something, Samsung betters it and vice versa. And the coming treat is relished by us, the users. 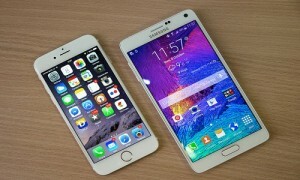 When Apple iPhone 6 was released, Samsung Galaxy Note 4 confronted it; and the world admired both of them. Here are ten differences that make both distinct by themselves. While iPhone 6 uses iOS 8 operating system, is 4.7 inches in physical size, and 129 g in weight, has resolution and pixel density of 750*1334 pixels, 326 ppi with a System Chip of Apple A8 with M8 co-processor, has a dual-core, 2600 MHz processor, and a built-in storage of 128 GB, battery capacity of up to 10 hours (LTE) – embedded, coming in capacities of 16 GB, 64 GB, and 128 GB, and has Apple Pay and the Touch ID fingerprint scanner as extras, the Galaxy Note 4 equally combats with all of them. The Note 4 has Android 4.4 as the operating system, is 5.7 inches in size and 176 g in weight, has a resolution and pixel density of 1440*2560 pixels, 534 ppi, has an Exynos 5433 system chip, Quad core, 1300 MHz processor, 32 GB built-in storage, battery capacity of 3,300 mAh – removable, a heart-rate monitor, fingerprint scanner, and a stylus as extras. The iPhone 6 does not have a removable storage option, while the Note 4 has a micro-SD slot that accepts cards up to 128 GB in capacity. You can also buy multiple cards. The iPhone 6 has an option of 128 GB of storage. An iPhone 6 has a “Reachability” option. On giving a tap twice to the Home button, the top half of the screen slides down, bringing all elements within reach when used in one hand. Its multitasking options consist of an application switcher that lets you scroll through open apps, along with a “Recent Contacts” bar. Note 4 has multi-window and pop-up window features. The pop-up view shortcut lets you shrink compatible apps to small windows which can be dragged and placed wherever you want. You can continue to work with the apps on the screen. The two-paned Multi-Window feature lets you view and interact with multiple apps in split-screen modes. The lighter weight metal iPhone seems more hand-friendly with its rounded edges; for some people, the protruding camera may not be much to their liking. Note 4 also has a metal frame, obvious towards the edges. It has a faux-leather textured rear cover and a removable rear panel to access the battery. Its high definition resolution at 2560×1440 and pixel density makes it ideal for watching video, playing games, and viewing photos, while the iPhone 6’s 750×1334 screen might have to take a bow. The iPhone 6 has an In-plane switching (IPS) panel making the display brighter, with better viewing angles and sharper images. Note 4 has higher pixel density and uses Super AMOLED (active-matrix organic light-emitting diode) making it easier to see in direct sunlight. Super AMOLED tends to provide better contrast and has less impact on battery life since no backlight is needed. Note 4 has a 2.7 GHz Qualcomm Snapdragon 805 chip with 3 GB of RAM and Adreno 420 graphics. Apple’s iPhone 6 features 1.4 GHz A8 64-bit processor and M8 motion coprocessor, which it pairs with 1 GB of RAM. Both are 4G phones, with the iPhone 6 supporting more bands for roaming, but the Note 4 is theoretically faster with Cat 6 (up to 300 Mb/s) rather than Cat 4 (up to 150 Mb/s) 4G. The Note 4 adds MHL, an IR blaster, and Samsung’s Download Booster, which combines the power of 4G and Wi-Fi for faster downloads. Both these smartphones have fingerprint scanners, but only Samsung is sold with a built-in heart-rate monitor and UV sensor. The 8 Mp iSight camera found on the iPhone 6 uses digital rather than optical image stabilization. The 16 Mp Note 4 uses Smart OIS. The iPhone 6 is able to shoot time-lapse video and slow-mo at 240fps, while the Note 4 is capable of 4 K recording. Note 4 takes “selfies” to a new level. It has a higher resolution front-facing camera of 3.7 megapixels compared to the iPhone 6’s 1.2 megapixels, plus a wide-angle selfie mode that lets you fit more into your selfies. The device even has a rear-camera selfie mode that has 13 megapixels. You can also use the Note 4’s voice controls to snap a selfie. S Note works with the bundled S Pen stylus in Note 4. The S Pen supports more than 2,000 levels of pressure sensitivity, compared to approximately 1,000 levels in earlier versions. It can be used for quick and precise on-screen navigation. The pen also lets you write on the Note’s display. You can select, cut, and paste text using the S Pen. It also helps in looking up definitions of words. A third-party stylus can be used with the iPhone 6, but the phone is not designed to work with a stylus. Note 4 also has other extras like S Health and S Voice, the former working with the Note 4’s heart-rate monitor. Apple’s Touch ID works in any kind of finger orientation, while Samsung’s Finger Scanner requires you to swipe your finger from top to bottom or from bottom to top and sometimes require two or three swipes to pass through. Touch ID on the iPhone is much more reliable according to some users. It becomes an issue when you pay. Apple uses Apple Pay, while the Galaxy Note 4 can also use a set of mobile apps to make near-field communication (NFC) payments, including Google Wallet and PayPal. Like Apple Pay and Touch ID, you can use the Note 4’s fingerprint scanner to authorize mobile payments when you use PayPal. Samsung’s Galaxy Note 4 has a 3220 mAh cell against Apple’s 1810 mAh. While the iPhone could last a day with careful use, the Note 4 will last a bit more than a day. Note 4 charging is faster, able to reach 50 percent in 30 minutes, while iPhone 6 gets to 50 percent in one hour. The Note 4’s battery is removable. It also offers an Ultra Power Saving mode. In iPhone 6, if you want rapid charging, you need to purchase a new cord or use the one that came with an iPad or plug your cord directly into a newer Mac that supports the feature. Vyas Sivanand. "Ten Differences Between an iPhone 6 and a Note 4." DifferenceBetween.net. September 1, 2015 < http://www.differencebetween.net/object/gadgets-object/ten-differences-between-an-iphone-6-and-a-note-4/ >.